Smartwool was founded in 1994 in Colorado and have been making socks in the United States with wool from New Zealand and Uruguay ever since. The socks are actually manufactured in plants in Tennessee and North Carolina. There is a pretty cool youtube video on the main page of their website on under the Made in the USA link. They also have a neat section on the site about their innovation and history of their socks. Pretty interesting if you like to know more about how socks work. The PhD Run Ultra Light Low Cut Socks, “socks” from here on out, are exactly what the description says – lightweight running socks. They feature Smartwool’s “4 Degree™ elite fit system, Indestructawool™, a virtually seamless toe and men’s specific mesh ventilation zones.” They are comprised of 49% Merino Wool, 47% Nylon, 4% Elastane according to the website. 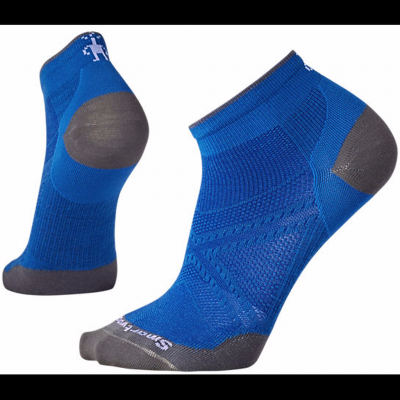 The Smartwool PhD Ultra Light Low Cut socks retail for $15.95. That covers the technical aspect but the question is how do the socks feel. When the socks arrived, I immediately put them on and went for a run. The socks are light and very comfortable next to skin with no itching from the wool fabric. Actually the socks are super soft. My foot size is a 9 so I am on the small end of the large size range so my foot does not exactly line up with the Indestructawool™, reinforced area on the heel; this will be an area to watch for durability. The socks are very thin with minimal cushioning as I expected. My initial impression is positive. I will evaluate the socks on the following two main characteristics – comfort and durability. Some of the questions I will look to answer are: Are the Smartwool socks comfortable? Do the socks wick moisture well? Do the socks keep my feet warm or cool depending on the conditions? How many miles can I use the Smartwool socks for before they wear out? Can I wash and dry the socks with my other clothing? Thank you for reading my initial review – please check back in a month or so to see how the socks performed. I used the Smartwool socks for the following activities over the past month – runs and hikes on the Mississippi River Levee by my house in New Orleans, backpacking on the Backbone and Carol Dorman Trail in the Kisatchie National Forest in Northern Louisiana, and while running the last 40 miles of the 130 mile Great Mississippi River Levee run from Baton Rouge to New Orleans. Trail conditions have included pavement, sandstone and pine needle covered trails, and fine dust and large gravel rocks on the Levee. Temperatures have ranged from the upper 80s to the low 30s. I have not experienced any significant precipitation while running and hiking in the socks. As I mentioned in my initial review, I evaluate socks on two main factors comfort and durability. I will start with comfort. These socks are super thin, but feel amazing. 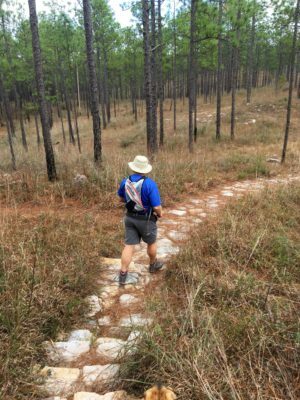 They were comfortable enough that I wore them for four day straight while backpacking in the Kisatchie National Forest. When we got to camp each night, I would leave them on and slip into a pair of camp clogs and keep them on until bed time even though temperatures dropped into the 30s at night. The socks have just enough compression to stay in place and feel like a gentle hug on my feet. I am also pleased with how well the socks performed wicking sweat from my feet. During the Great Mississippi River Levee run, I wore them while temperatures were in the upper 70s during the afternoon and into the night where temperatures dropped into the 30s. My feet were dry and warm even as the temps plunged. I noted that the socks were a little big for my size 9 foot. However, this has not been a problem and I have not noticed any issues by being on the lower end of the large size range. I also pleased to report that I have not had any blisters while wearing the socks. I will admit that I use anti chaffing lube in between my toes on long runs, and this also helps ensure I don’t get blisters. The second factor I focus on is durability. I am hard on socks and they generally take a beating. During the Great Mississippi River Levee run the gravel surface we were running on also had this fine dirt that got into my shoes and socks no matter what I did. After running 130 miles my feet felt like they had been rubbed with sandpaper for 37 hours. However, the Smartwool PhD® Run Ultra Light socks showed no signs of wear. As a matter of fact the socks continue to look new with only some cosmetic piling. I am fairly surprised by their durability. I thought the socks would show wear quickly because they are so thin. This is an area I will continue to watch as I run and hike in them until my next update. Over the past month, I have continued to use the socks for running and hiking. My go to place has been the Woodlands Conservancy in Belle Chasse, Louisiana for running as I regain my legs from the Great Mississippi River Levee Run. I also used the socks while running in Oklahoma City during the holidays, while running on the Levee by my house in Algiers, and while hiking and backpacking the Richardson Creek Trail in the Homochitto National Forest in Mississippi. Temperatures ranged from the 70s to the 20s and a few of my runs where in light rain. As I stated when I started there are two main factors I look for when reviewing socks – comfort and durability. I maintain my initial stance – these socks are super comfortable. They have retained their elasticity and continue to fit my foot well. I just like wearing them. They feel great against my foot, they breathe well, and dry out quickly after a hard run or all day hike. While hiking the Richardson Creek Trail in the Homochitto National Forest, I wore them from the moment I got up, then on a 5 plus hour hike of the trail, and then kept them on when I got back to camp and slipped into a pair of camp clogs while relaxing around the fire and cooking dinner. I only took them off for bed, because I like to have a pair of dedicated sleeping socks. So far the durability of the socks seems to be pretty good. I am beginning to notice some wear in the ball of the foot on both of the socks. The socks are pretty thin and there are no holes, but there is noticeable wear just in this one spot that was not there at 130 miles when I did my last update. Nothing lasts forever, but I do think the life of these socks is good, and they are not done yet by any means. I will continue to monitor this area and will provide an update when and if I wear through the socks. Overall, these are great socks. I like to use them for all of my outdoor adventures and will continue to wear them until they fall apart. 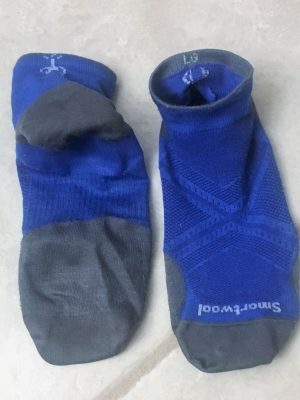 Thanks for reading my review and to 4alloutdoors.org and Smartwool for allowing me to participate in this review.